Drones are fertile male honey bees, and they are vital for the survivial of honey bee colonies. Their primary role is to mate with a receptive queen honey bee, in order to ensure future generations of honey bees, and indeed, expansion and creation of new colonies. Drones do little around the hive (or, if a feral bee – perhaps a hollow tree or cavity in an old building somewhere) - they don't clean or build honey combs, for example. They help themselves to nectar stores, yet they don’t do much to help out with the kids (okay, okay, I’m humanising them a bit – the brood!). Heck, they don’t even go out and get food for the colony! It is sometimes said that drones spend their time drinking nectar, mating (in the air at that! ), and lazing around on flowers. "Honeybee drones are often called “lazy Willi” (Bonsels, 1912) and are often assumed to merely function as “flying sperm”, necessary to inseminate virgin queens". "This view, however, is not correct." (2). Drones perform precisely the role that nature gave them. Below, you can read about the importance of honey bee drones. They may live for just a few weeks or upto 4 months. They die straight after mating! Not all drones get to mate. At the end of the summer, or when the going gets tough, they’re the first to be kicked out of the colony, so as not to drain resources. Drones are fatherless.....yet they have a grandfather! It takes 24 days for the drone to develop from being an egg to a fully grown adult bee. Drones are essential to the health and survival of future honey bee colonies. How Large Are Drone Bees? 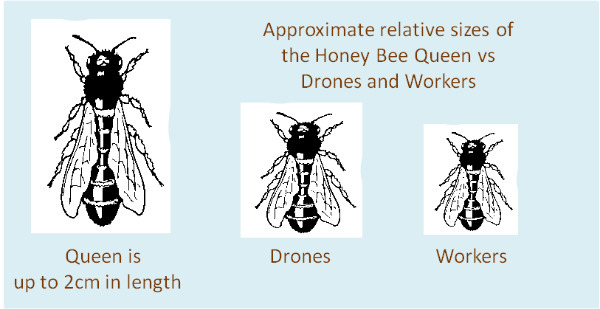 Drones can vary widely in size, but they are larger than workers, and smaller than queen honey bees. The cells they develop from are slightly larger than worker cells. They also have significantly larger eyes in comparison with queen and worker honey bees. Drones ensure the continuation of honey bees as a species, by mating with queens. Drones can pass on important behavioural traits to new generations of honey bees, (such as hygenic behaviours) through their genes (1). Drones help to regulate the temperature in the hive or nest, and this is epecially important for the development of young bees and larvae. Honeybee larvae and pupae are extremely stenothermic, which means they strongly depend on accurate regulation of brood nest temperature for proper development (33–36°C) (2). Although each colony has far fewer drones than workers, they nevertheless pull their weight with regard to heat generation. Research indicates that Drones can produce one and a half times as much heat as a worker bee, and that even those Drones not directly next to the brood, are never the less assisting with heat regulation inside the nest (3). Drones are 'haploid', having been reared from an unfertilised egg. As a result, a drone has only half the chromosomes of a worker bee or queen bee - the drone has 16 chromosomes, workers and queens have 32. (That honey bee drones are haploid was first discovered in 1845 by a Polish apiarist, named Jan Dzierżon - often described as the "father of modern apiculture" - see History Of Beekeeping). A honey bee drone has no father, but he does have a grandfather! Being haploid means that drones can have a grandfather and grandsons, but a drone cannot have sons! Drones come from unfertilized eggs (they are 'haploid'), meaning that no male (drone) was needed in order for the queen to produce more males - in other words, they are formed without a male 'parent'. (In fact, at various times, female worker bees can and do also create drones, despite the fact that they do not mate with males - they are referred to as 'Drone Laying Workers'). But what about the queens - the mother of all the drones? In order for a queen to produce new queens, eggs must be fertilized, for which drone bees are necessary. This means that the queen (the "mother" of the drone), has a "father" - obviously a drone. This means that any drones produced by the queen, actually have a "grandfather" (i.e. the "father" of the queen) - more specifically, a "maternal grandfather" (the father of the queen). The queen who laid the drone eggs, is the offspring of an egg fertilized by a drone (male). Drones themselves, however, are the offspring of eggs that have not been fertilized by a male, and they are therefore, fatherless. This scenario, whereby offspring are reared from unfertilized eggs, is referred to by biologists as ‘parthenogenesis’. Each honey bee colony will produce several hundred drones (in contrast with the thousands of workers). On warm and sunny afternoons during the mating season, sexually mature drones, fly out of the nest (or hive) and congregate with other drones high in the air, to form a cloud of bees. There may be as many as 11000 drones from up to 240 different colonies (4). These clouds of drones can measure between 30 and 200m in diameter, and be located 10–40 m above ground (5). About one hour after the peak of drones’ departure from the hives, virgin queen will also leave her hive for her nuptial flight, and join the drone congregation (6). As soon as a virgin queen enters the congregation of drones, groups of drones are attracted to her, first by olfactory cues (pheromones), and at shorter range by visual cues. Drones follow the virgin queen in a comet-like swarm each competing to approach and mate with the queen (7). Usually, a queen mates within 15–30 minutes, and with just 10–20 of the thousands of drones, and each drone that mates with the queen will die after mating (8). This happens because the drone’s reproductive organs are torn away from its body, whilst the queen flies off, with the drones genitalia attached to her. How Long Do Drone Bees Live? Drones may live for just a few short weeks, but it is also possible they may live 3 to 4 months. They are expelled from their colonies by the end of summer, but in any case, by the end of autumn, there will be few or no drone bees around. Do Honey Bee Drones Sting? Unlike workers, the drone cannot sting. (3) Kovac H, Stabentheiner A, Brodschneider R. Contribution of honeybee drones of different age to colonial thermoregulation. Apidologie. 2009;40(1):82-95. doi:10.1051/apido/2008069. Baudry E, Solignac M, Garnery L, Gries M, Cornuet J, Koeniger N. Relatedness among honeybees (Apis mellifera) of a drone congregation. Proc R Soc Lond B. 1998; 265: 2009–2014. Koeniger N, Koeniger G, Gries M, Tingek S. Drone competition at drone congregation areas in four Apis species. Apidologie. 2005; 36: 211–221. Ruttner F, Ruttner H. Untersuchungen über die Flugaktivität und das Paarungsverhalten der Drohnen III. Flugweite und Flugrichtung der Drohnen. Z Bienenforsch. 1966; 8: 332–354. Loper GM, Wolf WW, Taylor OR. Detection and monitoring of honeybee drone congregation areas by radar. Apidologie. 1987; 18: 163–172. Loper GM, Wolf WW, Taylor OR. Honey-bee drone flyways and congregation areas: radar observations. J Kansas Entomol Soc. 1992; 65: 223–230. Koeniger N, Koeniger G. Mating behavior in honey bees (Genus Apis). TARE. 2004; 7: 13–28. Jean-Prost P. Observation sur le vol nuptial des reines d’abeilles. Acad Sci. 1957; 245: 2107–2110. Ruttner F, Ruttner H. Untersuchungen über die Flugaktivität und das Paarungsverhalten der Drohnen. II. Beobachtungen an Drohnensammelplätzen. Z Bienenforsch. 1965; 8: 1–9. (7) Gries M, Koeniger N. Straight forward to the queen: pursuing honeybee drones (Apis mellifera L.) adjust their body axis to the direction of the queen. J Comp Physiol A. 1996; 179: 539–544. Palmer KA, Oldroyd BP. Evolution of multiple mating in the genus Apis. Apidologie. 2000; 31: 235–248. Schlüns H, Moritz RFA, Kryger P. Multiple nuptial flights and the evolution of extreme polyandry in honeybee queens (Apis mellifera L.). Anim Behav. 2005; 70: 125–131.